Project: Further development of the 2008 master plan for FUCHS LUBRITECH, a specialist in the field of high-performance lubricants, which had already planned to expand at that time. A head building with 1,300 square meters of floor space was constructed to contain offices, communal rooms, and a quality assurance laboratory. 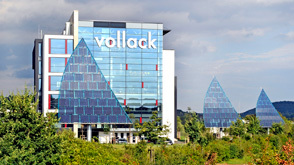 The building connects the new production modules with the structures previously realized by Vollack. An automated high-bay warehouse is also being added, which will feature 1,700 square meters of floor space and an office extension that can accommodate up to 80 additional workplaces.